World-reknown marine artist and conservationist. WYLAND (WYLAND.COM) IS A renown marine life artist, writer and conservationist. 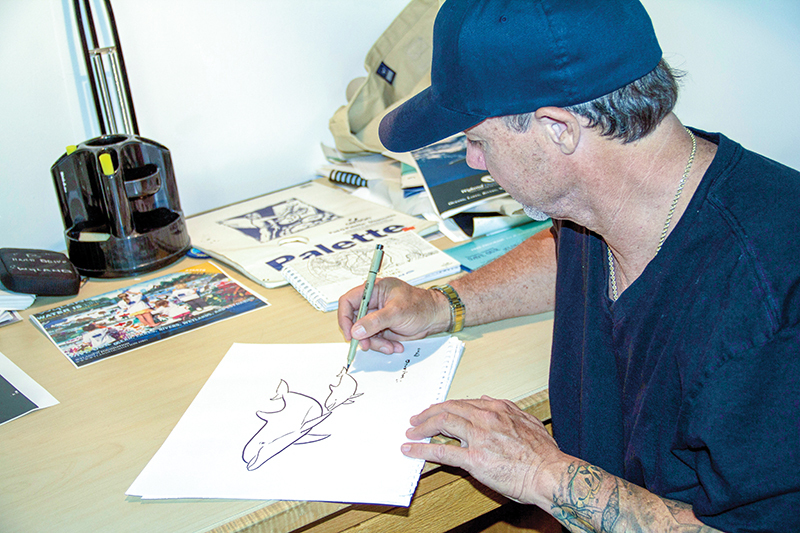 He has multiple art galleries across the nation, with his flagship gallery in the community of Laguna Beach, Calif. His art has an emphasis on education and inspiration, and Wyland’s goal is to introduce people to the power of nature. His Whaling Wall mural project included 100 murals painted across the globe, culminating with the 100th wall in Beijing in 2008 in honor of the Summer Olympics. Sea: Detroit is nowhere near the ocean, how did you start there and end up as a marine artist? Wyland: I was born in Detroit, surrounded by the Great Lakes but far from the ocean. As a young artist, the lakes were my ocean. The fact is, the lakes connect to the ocean and water connects all 7 billion people on Earth. Are you a boater? How do you like to get out on the water? I’ve been on boats my whole life and currently own a 26-foot Pro-Line that I have at my Islamorada, Fla., home. The boat is on a lift at my dock and I have all the best dive sites on GPS. When it is nice out, I’m diving in the Keys. You have traveled and seen many different seas, why did you choose Laguna Beach as your home base? I visited Laguna Beach when I was 14 years old. It was there that I saw the ocean for the first time. I said to myself, I want to live in this art community one day. Ten years later, it happened. I moved to Laguna Beach to begin my art career and paint the first of 100 ocean murals. What is your favorite thing to do in Laguna Beach? I love Laguna because it is very inspirational — the ocean and the coastline. It has a long history of artist livework studios, which I have on a grand scale. 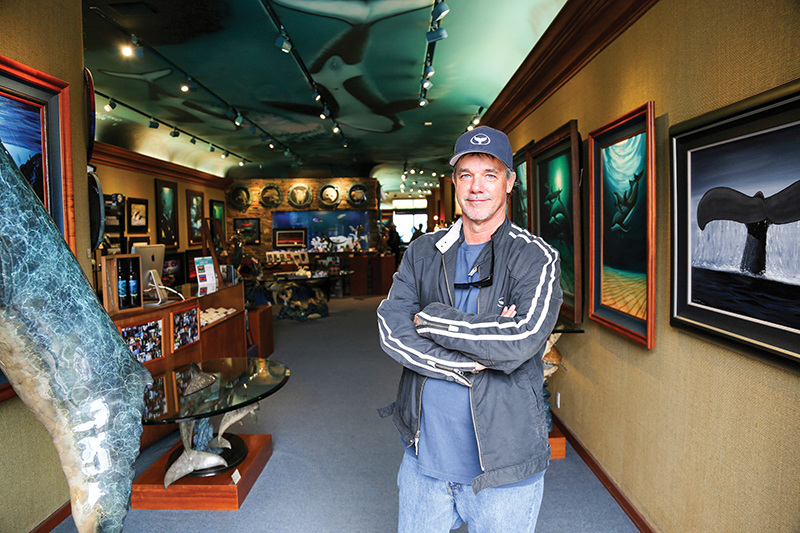 I actually live above the Wyland Galleries, and that is where I have my live-work studio. It is also a great community where everyone supports conservation and other causes that keep our ocean and coast protected. Why are SoCal boaters lucky to boat where they do? Boaters, like divers, are on the frontline of making sure that they fish the right way and support clean water and a healthy ocean. It just makes sense for boaters to conserve and protect the quality of life that we all want for us and future generations. Southern California has some of the best boating opportunities on the planet. First and foremost, you don’t have to go to Sea World. Five minutes out of the different harbors, you have thousands of dolphins, gray whales, blue whales and a wide variety of marine animals that call Southern California their home. It is a Pacific paradise for boaters and the people who are fortunate enough to know someone who owns a boat. What marine animal is your favorite and why? Hawaii has many beautiful marine animals, but my favorite continues to be the humpback whale. It was the first great whale that I had a chance to swim with eye to eye off the shores of West Maui. I also love the spinner dolphins and the beautiful Hawaiian monk seals. Hawaii also has some of the best diving throughout the island chain. How do you find inspiration for your murals? I see beauty everywhere, when I’m diving, when I’m traveling to these beautiful places. It’s nature that inspires me to spread its beauty through my paintings, sculptures, murals and, now, music that I write and produce. I also like making documentary fi lms about different issues. It’s really a lifestyle brand that I have created for myself. Really, a hobby that got out of control. Which project in your multidecade career are you most proud of? Well, of course, I’m proud of completing 100 giant murals throughout the world. It took me 27 years to accomplish that goal. Now I am planning 100 monumental sculptures for 100 great cities in the next 25 years. Ten of the 100 monumental sculptures will be underwater. So you will have to dive or snorkel to see them. But the thing I’m most proud of is having painted with over 1 million kids in all 50 states and many countries around the world. The idea was to use art and science to inspire a generation to be ambassadors for the planet. How would you like your art to change people’s perceptions of the ocean? Art is the most powerful medium to communicate the conservation message. When people see the beauty in nature, through art, they will be inspired to protect it. Not everyone is going to get a chance to swim next to a blue whale, but if they can see an image, it has a profound impact on them. Tell us more about the Wyland Foundation and what it means to you. Twenty-three years ago, I decided to organize my Wyland Foundation, a 501(c)3 nonprofit. The goal was to bridge the worlds of art and science. Generally, it is one or the other. For me, art and science are connected naturally. I use both to inspire people to take action to ensure we have clean water and a healthy ocean. Above all, we need a healthy world to ensure the quality of life for all of us, today and in the future. Our chief scientist is Dr. Sylvia Earle from National Geographic. We also have Dr. Greg Stone and many other amazing people who have supported us from the beginning. I encourage everyone to check us out at wylandfoundation.org and learn more about our small but mighty grassroots organization. Can you tell us more about the Whaling Walls project and what it represents to you? The Whaling Walls project really was my way of sharing the awesome beauty of our great whales, painted life-size to scale in their ocean environment in public places throughout the U.S. and around the world. Not everyone is going to have a chance to see a great whale, but if you see one depicted lifesize on the side of a building, it really is a wakeup call. I also enjoy when schools bring their kids in and they line up next to the whale to really see how large these giants are. It really makes an impression on them. The Wyland Foundation and all of our conservation partners are launching the largest water conservation project in history. For the next 10 years, we are reaching out to all 7 billion people on the planet to inspire each of us to be water-wise. It only takes one minute to learn how we can save water, save energy, save money and save the planet. I hope all your readers will take a moment and take action by going to worldwaterpledge.com to ensure we have water, the source of all life for our future.